Whenever I'm asked what my favorite ensaymada is. There is only one answer - it's Chona's Homemade Treasures Ensaimadas. I swear, its the best that I've tried. It has been my benchmark for all ensaymadas, I have this certain hesitation when trying ensaymadas to be honest - because I don't want to be disappointed. I don't want to waste calories for nothing - honest! And I feel that most ensaymadas are dry and not soft to the bite. My standards have changed since having Chona's ensaymada. When I got home from the long weekend, I was surprised to see a box of ensaymadas from Portobello Bakery (same owners of Cookies Unlimited). I need to be honest. I was a bit hesitant. As I said, I didn't want to be disappointed. But then, I knew that Aubrey won't send me some if she didn't feel confident about them. The box looked so pretty. Something that I love about Cookies Unlimited and Portobello Bakery is that they take into consideration the packaging. I am one who appreciates nice packaging. I like it when they're dainty - even if it was simple, for me - it showcases the personality of the bakers. First impressions, diba? I need it to be presented *cleanly*. You know what I mean. And my first impression was that it looked really nice, clean and elegant. Look at the box. 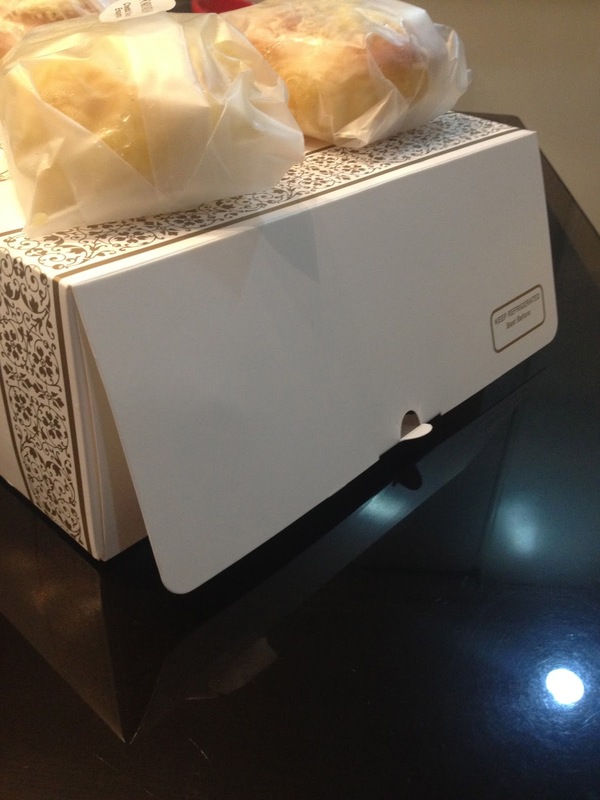 Look at how the ensaymada was carefully wrapped. Look at the stickers. Those details are important to me. Well, the taste if of the most value, but then how your present matters to me. But that's just me. I was really nervous. I held on to one piece, and noticed the plastic wrap, I love frosted plastic wraps, and they're not thin - they're quite thick. I took pulled off the sticker (I took it out smoothly!) and opened it, smelled the ensaymada and I immediately decided to take a bite. It was very very soft. That alone convinced me to make another bite. It was really good. Not just good - the ensaymada smelled wonderful. I loved that I could taste the cheese and it wasn't overyly sweet, It was really good. I mean really good. I had my Panget try a bite and he asked for a whole piece! We don't usually lean towards ensaymadas but tasting this ensaymada from Portobello Bakery - we're loving every bite of it. I must say, this ensaymada has bagged one of the top spots of my ensaymada heirarcy. This is a close second to my favorite Homemade Treasures. Chona, you need to watch out for Portobello Bakery. It's getting close! Hihihi.. If you're into ensaymadas - please do head on to SM Megamall Building B where Portobello Bakery has a stall on the 5th floor and get yourselves some. I promise you, you won't regret it - it's totally worth the calories.